Every year for nine years, right before spring break, PCA&D students shut themselves in to give back to the community. 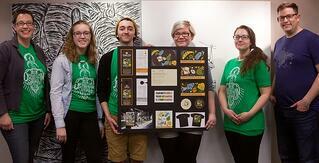 At the annual Designathon, PCA&D’s Graphic Design Department and the student chapter of AIGA (The American Institute of Graphic Arts) coordinate the event, a 24-hour marathon to design quality graphic materials for local non-profit organizations. Applications are currently available for any non-profit who would like their project considered for the 10th annual 2018 Designathon. 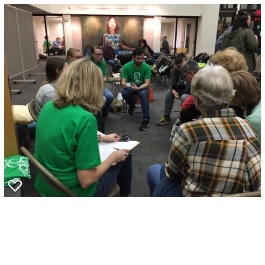 Eight to ten non-profits will be selected for the event where PCA&D students, aided by faculty and alumni (and countless gallons of coffee) work overnight, February 23 & 24, 2018, beginning at 6 p.m. February 23. The 24-hour Designathon is an annual event held by the College’s American Institute of Graphic Arts Student Chapter (AIGA) that provides professional-quality design services at no charge to area non-profits and to the community-at-large. Students at PCA&D who participate in the Designathon gain real-world experience in creating projects for clients under a tight, 24-hour deadline. They learn that non-profits have very real marketing needs in order to be successful, and strong graphic design on well-organized collateral pieces are vital components in successful communications and marketing plans. More importantly, students experience the value of giving back to the community.